One of the most disputed topics among shaving enthusiasts has to be the electric shavers vs manual razors debate. There are undeniable benefits and shortcomings regarding both approaches and there are no definitive rights or wrongs here. In this article we’ll take a step back and present an objective overview of the advantages and drawbacks of electric and traditional shaving. One of the main reasons for switching to electric shaving is the practical side of it: no more lengthy, thorough prep work, no more lathering and no more hassle to clean and take care of your shaving arsenal. You just grab your electric shaver and get straight to shaving. After that, you can simply toss it into the automatic cleaning and charging station and that’s about it. Electric shavers are also more convenient for shaving on the go. Traditional shaving implies the use of a sharp blade and that inherently comes with some risks. Careful prep work and proper technique can greatly diminish these risks, but only up to a point and for some less fortunate men a razor blade just isn’t an option. Normally, using an electric shaver will provide more comfort, less irritation and no nicks and cuts. All of these while still offering an adequately close shave. Most men with sensitive skin that is prone to irritation, razor burn, ingrown hairs and bumps will likely benefit from switching to an electric razor. 3. You don’t have to give up wet shaving. In fact, you really shouldn’t as the addition of a nice shaving cream can greatly improve the closeness and comfort of your shave. Most of today’s electric shavers are waterproof and can be used with shaving creams and gels. This may seem like defying the whole purpose of an electric razor for some, and that’s completely legit. After all, one of the main advantages of electric shavers is not having to deal with the messy lathering and cleaning that are usually associated with traditional shaving. But if you went for an electric shaver just for the extra comfort, a wet shave can further improve your experience. You can also check out our extensive guide on how to choose a quality shaving cream. Wet shaving has that barbershop luxury feeling and you can still enjoy that on weekends for example if you’re constrained by time during the week. 4. Electric shavers can be economical. 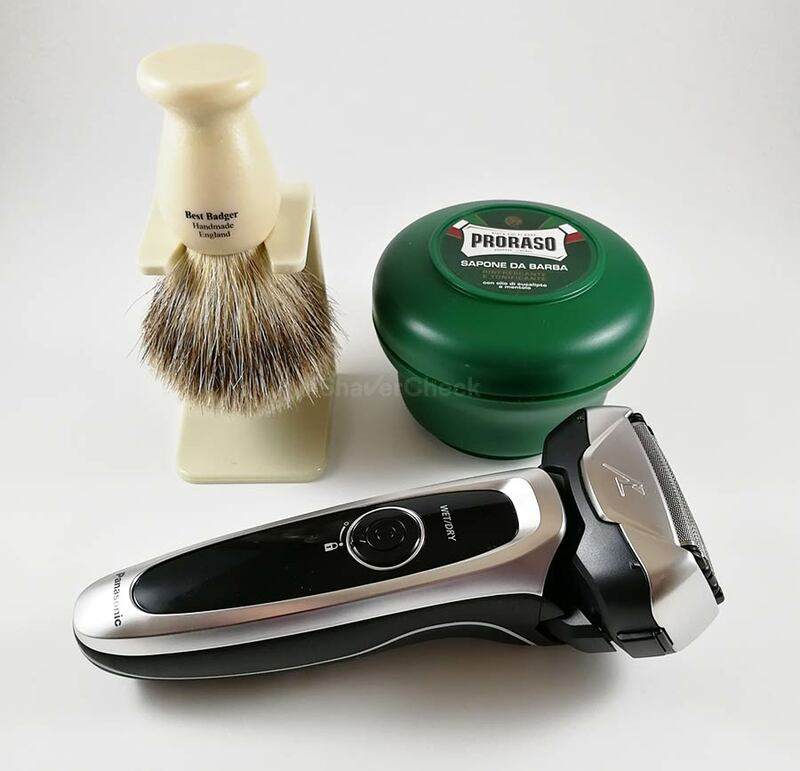 The initial purchase cost is usually pretty high (even though you can find excellent razors at a very reasonable price), but in the long run it will definitely be a good investment. Given proper care, a quality electric razor will last for many years. It will however require replacing the blades and foils (usually once every year). Even so, when compared to blade refill cartridges that are expensive and won’t last too long, you can easily see that you’ll be saving money. Unfortunately, as far as costs go, an electric shaver can’t match a double edge razor that runs on dirt cheap single blades. 1. Electric shavers don’t shave as close as a blade. Even though high-end shavers like the Panasonic Arc 5 can get very close performance-wise to a blade, they still can’t match it. This is a personal and subjective matter to some extent, as many men claim to get shaves that are just as close by using an electric razor. Your mileage may and will, of course, vary. Moreover, a blade will also exfoliate the skin by removing the top layer of cells and that’s also beneficial (make sure to exfoliate your skin regularly if you’re using an electric razor). However, the closeness of the shave is part of a compromise you’ll be accepting when switching to electric shaving. And getting comfort for a slightly less close shave is not a bad deal at all. 2. It takes time for the skin to adapt to it. When using an electric shaver for the first time, you will most likely be disappointed by the results (you may even experience some razor burn, patches of hair left behind etc.). But before sending it back or returning to your old manual razor you should allow your skin at least 3 weeks to adapt before making that decision. Also, it takes practice to get used to it and your technique will get better. You can also check out our tips for getting the most out of your electric shaver. 3. Purchase price and upkeep can be expensive. High-end electric shavers are expensive. Also, the replacement parts and cleaning cartridges can be pretty costly. You don’t necessarily need a top of the line electric razor in order to get very satisfactory results, so make sure to check out the reviews section to help you find the right shaver. 1. The closest possible shave. Regardless if you’re using a straight, double edge or even a cartridge razor, a blade will almost always shave closer to the skin than an electric shaver. Also, proper prep work, quality products and the right technique can yield great results in terms of both comfort and closeness. This mainly holds true for double edge razors that use a single blade. They are sharp, inexpensive and will last longer compared to refill multi-blade cartridges. 3. There’s something manly and pleasant about old-school shaving with a blade. Hot water, a soft badger brush, a vintage DE razor and wonderfully scented shaving cream — these are some of the things that make traditional wet shaving such an enjoyable ritual. You’ll never look this cool while shaving with your flashy electric razor. 1. It’s time-consuming, it requires extensive prep work and a handful of tools that also need careful maintenance and cleaning. Just think about traveling and having to deal with a sink full of water, razor, blades, shaving cream, shaving brush, pre-shave oil and alum as opposed to carrying just one item. 2. Manual razors have a steep learning curve. Having a steady hand takes time, especially when using DE and straight razors. And this leads us to the next point. 3. It increases the chances of getting nicks, cuts and razor burn. Shaving with a blade can also lead to more serious issues for men with sensitive skin, like ingrown hairs and razor bumps. There are ways to vastly improve your experience (by using the right products and technique), but sometimes it’s simply not enough and electric shavers are the only viable option. 4. Refill cartridges are expensive and you need plenty as the blades tend to go dull pretty quickly. The electric shavers vs razors battle seems to have segregated the shaving community into two camps. However, the best shaving method is actually the one that works best for you, regardless of your reasons for choosing one over the other. It can be dry electric shaving for its convenience and time efficiency, it can be wet electric shaving for the comfort or it can be traditional shaving for the closeness and pure enjoyment. Pick your poison and enjoy your shave! Q1- I have a hard shave. Will electric shaver work for my kind of beard? Q2- Philips has wide variety of electric shavers. Which one do you recommend for best performance for hard beard? Yes, an electric shaver can definitely work on a coarse beard. Not all of them though — usually the cheap, basic shavers will lack the power needed to effortlessly shave a thick beard. Regarding Philips shavers, the best one I’ve tried so far is the S9000 Prestige (you can read my review of it here). However, it is also very expensive. The regular Series 9000 9300 is also a very good razor, it comes with a cleaning station and it’s usually a lot cheaper (but it’s not as comfortable as the Prestige models). If you must have a Philips electric shaver, these two are the ones I’d recommend for a tough beard. If you’re willing to consider other brands as well, the Panasonic ES-LV65-S Arc 5 is probably the best bang for the buck. It’s very powerful and shaves extremely close. There’s also the Braun Series 9, another very good option. It is more comfortable than the Panasonic and works better on a longer beard (like 3 days or more), but it is more expensive and the Panasonic is a bit better with regards to closeness. Hello, I was considering to switch from traditional (GIlette) to electric, I am considering (Panasonic Germany eS – LV9Q S803 Premium with Ultraflexiblem 5D Clipper Head Electric Shaver For men, beautiful Wet and Dry Razor + Cleaning Station, Silver). However I have a really hard beard and I am shaving it twice – once down the beard, and once against – to get the closest shave. My skin is not sensitive and I don’t have any problems with that. Also, I don’t mind to use an electric with gel under the shower. So, my questions is, is it worthy to try it? Because the Panasonic is quite expensive compared to analogue Gilette and also if I purchase it from Amazon Germany (I live in Bulgaria), and I am not pleased, it could be quite hard to use the return option. The third generation Arc 5 (like the ES-LV9Q you’re considering buying) would arguably be the most suitable choice for a very coarse beard. Also, because you don’t have sensitive skin and I suppose you will be shaving regularly, you should get excellent results. If this shaver can’t make it, I highly doubt any other current electric shaver will. It is a pricey model, but the money spent on Gilette cartridge razors can add up over time as well. It’s really up to you to decide if the convenience of using an electric shaver is worth paying a rather high purchase price. For example, I can’t really see myself going back to manual razors, shaving cream and lengthy, painful wet shaving.